The Greater Reading Suburban Office Market ended the 1st quarter of 2015 with a vacancy rate for Class A Office buildings at 15.01% percent which includes existing and proposed sites. The vacancy rate for only Existing Class A Office Buildings is 4.39%. There were no changes in vacancy rates from the close of 2014, however it is an increase from the same period 2014. The average rental rates remained unchanged at $17.50 – $22.50 per square foot Modified Gross, which is a decreases in the rates from the same period in 2014. The Class B Suburban Office Market ended the 1st quarter of 2015 with a vacancy rate of 18.19% for existing and proposed sites. The vacancy rate for only Existing Class B Office buildings is 15.98%. This is a slight decrease in vacancy rates from end of year 2014, and it is larger increase from the same period in 2014. The average rental rates remained unchanged at $12.50 – $15.50 per square foot Modified Gross from the End of 2014 to 1st quarter of 2015 and that is a larger decrease from the same period in 2014, when average rental rates were $12.50 – $17.50 per square foot. And the Class C Suburban Office Market ended the 1st quarter 2015 with a vacancy rate of 14.28%, which is a slight decrease from the same period 2014. The outlook for the office market sector going into the 2nd quarter of 2015 is very optimistic due to the high level of interest in the marketplace. There are upwards of 80,000 sf. of deals in the marketplace. Cap Rates for Investment grade office buildings remains low due to attractive financing. The most important variables are length of leases, credit of tenant(s), type of lease, and type of asset (I.E. Single Tenant, Multi-Tenant, Medical, Back Office). The Greater Reading Downtown Office Market ended the 1st quarter of 2015 with a vacancy rate for Class A Office buildings at 22.64%. It was a slight increases in rates from the end of year 2014. The average rental rates remained unchanged from 4th quarter 2014 thru 1st quarter 2015 at $11.00 per square foot Modified Gross to $14.50 per square foot Modified Gross. The reason for the slight decrease in vacancy rates was due to the relocation and expansion of an existing downtown engineering firm. The Class A market noticed a benefit of the expansion, however Class B space would see a slight increase due to the move. The Class B Downtown Office Market ended the 1st quarter of 2015 with a vacancy rate of 21.68%. This was a slight increase in vacancy rates from the end of 2014, and it was a large increase from the same period in 2014. The average rental rates remained unchanged at $7.50 per square foot Modified Gross at the end of 2014 to $11.00 per square foot Modified Gross, this is similar to the rates from the same period 2014. Overall Vacancy Rates for Class C buildings remained unchanged at 23.62%. The Greater Reading Suburban Office Market ended the 4th quarter 2012 with a vacancy rate for Class A Office buildings at 18.5%. This is a slight increase in vacancy rates from 3rd quarter 2012 and an increase in vacancy from same period 2011. The average rental rates remained steady at $16.00 – $19.50 per square foot Modified Gross which is a slight decrease to the rates from the same period 2011. Deals of primary focus within Class A building sector were the 48,000 sf National Penn Bank location proposed at the Spring Ridge Corporate Center, which will be leased 100% to Nat Penn, and the new Fairfield Inn proposed along Meridian Blvd., is assisting to reduce the office vacancies by approximately 113,600 sf. The Fairfield Inn is purchasing three proposed office pad sites at 3 Meridian Blvd. The Class B Suburban office market ended the fourth quarter of 2012 with a vacancy rate of 18.98%. This is a decrease in vacancy from 3rd quarter 2012 by less than one percent, however it is an increase from the same period 2011 by almost four percent. The average rental rates remained unchanged from 3rd to 4th quarter 2012 at $11.00 – $16.50 per square foot modified gross opposed to that of rates from the same period 2011 which was $13.00 – $18.00 per square foot. Deals of primary focus within the Class B building sector were the new leases at 975 Berkshire Blvd. of 5,000 sf, and Stonepointe Center at 10,550 sf along with the recent purchase of 30,966 sf at 6 Commerce Drive by Brentwood Industries. And the Class C Suburban office market sector ended the 4th quarter of 2012 with a vacancy rate of 10.97% which was an increase from the 3rd quarter 2012. Our outlook for the office market going into 2013 is very optimistic with activity levels at new highs within the market place and owners offering additional incentives and concessions to assist in getting deals done. Click Here to go to my office reports, including Suburban 4th Quarter. Bryan joined NAI Keystone in July of 2004, prior to joining NAI, Bryan Cole spent 4 year’s active duty in the U.S. Marine Corp, including a 6 month deployment in Afghanistan, a 4 month deployment in Kuwait/Iraq, and a 7 month deployment in Japan. Prior to joining the military Bryan was involved in the construction of commercial and multi-unit properties in the Philadelphia suburbs. Bryan has experience working with a diverse group of individuals in numerous countries throughout the world. During Bryan’s time at NAI, he has sold and leased in the excess of $290 Million Dollar’s worth of Commercial Real Estate. Because of this, Bryan earned NAI gold club status his first year in the business. Bryan is currently working on earning both his CCIM designation and SIOR designation. Bryan has been the Top Performer/Producer at NAI since 2006 with an average of $30-$35 Million in production annually and over $64 Million in 2012. The Greater Reading Suburban Office Market ended the third quarter 2012 with a vacancy rate for Class A Office buildings at 18.48%. This is an Increase in vacancy from 2nd quarter 2012 and an Increase in vacancy from same period 2011. The average rental rates remained unchanged for the most part at $15.00 – $21.00 per square foot Modified Gross which is similar to that of rates from the same period 2011. 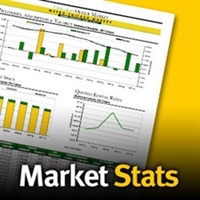 The Class B Suburban office market ended the third quarter of 2012 with a vacancy rate of 20.57%. This is an Increase in vacancy from 2nd quarter 2012 and a sharp increase from the same period 2011. The average rental rates remained unchanged from 2nd quarter 2012 to $11.00 – $15.00 per square foot modified gross opposed to that of rates from the same period 2011 which was $13.50 – $18.00 per square foot. The main deals of focus within Class B buildings were the new vacancies at 965 Berkshire Blvd which consists of 11,014 sf., and the vacancies opened up by the medical users moving to Reed Ave.
And the Class C Suburban office market ended the third quarter of 2012 with a vacancy rate of 8.42%. Our Outlook for the office market at the closing of 2012 is very optimistic with activity levels at new highs within the market place and owners offering additional incentives and concessions to assist in getting deals done. New Construction remained unchanged for the third quarter of 2012, with approximately 329,000 sf. of proposed product still available. The 4th Quarter 2012 into the 1st Quarter 2013 will see an increase in new construction with the newly proposed National Penn Facility in Spring Township consisting of approximately 48,000 sf. And the 30,000 sf. Spec building at the Wyomissing Corporate Campus. The rebound in office-using jobs is spreading to smaller businesses, which dominated office leasing activity during the first quarter of 2012. The continued positive absorption, coupled with dwindling supply of available space, is setting the stage for resumed rent growth in U.S. markets over the next few years, CoStar Group reported this week in its First-Quarter 2012 Office Review & Outlook. Though weaker than in recent quarters, office space absorption in the U.S. held steady at 11 million square feet in the first quarter while the national office vacancy rate fell 10 basis points to 12.7%, according to the report presented to CoStar clients by Walter Page, director of research for Property and Portfolio Research (PPR), CoStar’s analytics and forecasting division, and Jay Spivey, CoStar senior director of research and analytics. While overall job growth has been less than expected, the economy is converting the number of temporary jobs to permanent fulltime jobs at a faster clip and employees are working a greater number of hours on average, trends that bode well for office demand and rent growth over the next three years, the CoStar economists reported. If job forecasts hold up, the unemployment rate will fall to its long-term of average of below 6% by 2015. For the first time in several years, none of the top 20 U.S. office markets reported job losses, with hiring especially strong in energy markets such as Houston and Dallas/Fort Worth, and technology markets such as San Francisco, San Jose and Denver. Meanwhile, rising energy prices are causing a parallel increase in construction costs. This trend, combined with higher interest rates required to support new office construction, will likely curtail the level of new supply until rents begin to justify new supply, buying more time for vacancies to decline further, Page said. The 11 million square feet in total absorption, while comparable with historical average, declined over the last couple of quarters and remains far below levels from the mid-2000s, when 30 million to 40 million square feet per quarter in office space absorption was routine. Despite solid job growth, office landlords and their tenants continue to hold a large amount of so-called shadow space, unused but not officially listed as vacant. Gross leasing activity, the type of metric broker commissions are based on, is projected to be nearly 120 million square feet in the first quarter. Leasing is now dominated by smaller tenants, with over 50% of transactions involving blocks of space measuring 2,000 square feet or less in 2011. At the same time, large tenants are very rare in the market, with transactions over 50,000 square feet representing less than 1% of total activity, according to new data generated by PPR and CoStar. “Roughly half of the tenants in the CoStar database occupy between 2,000 square feet and 20,000 square feet, and that’s the sweet spot of liquidity within the office sector,” Page said. Tenants are also becoming more efficient in their real estate usage, with footprints on new leases down 6% over the last 10 years. While Class A tenants have seen a modest 3% increase in square footage, the amount of Class B space taken is down by 5% and Class C space down 13%. CoStar and PPR project the national vacancy to decline to 10.5% by the end of 2015, with the corresponding increase in occupancy leading to boosts in NOI, rent growth and other factors that tend to boost property values. Meanwhile, the supply pipeline will remain at low ebb until 2015, and occupancies should continue to rise ever in the event of a spike in energy prices or a meltdown in the European economy. Tenants, finding a scarce supply of Class A property, are starting to gravitate to Class B buildings, and smaller tenants are back in the market — both indications of a broadening of the recovery that’s helping more employers hire more workers. Bryan joined NAI Keystone in early 2004, but before joining NAI, Bryan Cole spent 4 year’s active duty in the United States Marine Corp, including a 6 month deployment in Afghanistan, a 4 month deployment in Kuwait/Iraq, and a 7 month deployment in Japan. Prior to joining the military Bryan was involved in the construction of commercial and multi-unit properties in the Philadelphia suburbs. Bryan has experience working with a diverse group of individuals in numerous countries throughout the world. During Bryan’s time at NAI, he has sold and leased well over $230 Million Dollars worth of Commercial Real Estate. Because of this, Bryan earned NAI gold club status his first year in the business. Bryan is currently working on earning both his CCIM designation and SIOR designation. Bryan has been NAI Keystone’s Top Performer since 2006. The 2010 Greater Reading Office Market was much more active than the previous year although vacancy rates still increased throughout the local market. This was due to the majority of the deals taking place being from within the county. 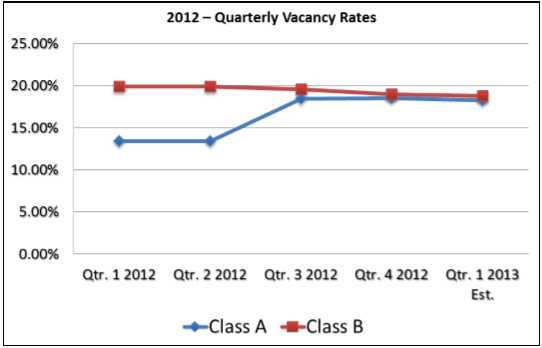 The office market continued to experience both companies downsizing along with relocating their existing offices to take advantage of the decreasing rates and increase in incentives. The good news is that there were a number of companies who increased their footprints including The Reading Hospital and Medical Group, UGI, and C&L Group. This is good to see in a market which has experienced less than favorable absorption rates within the past few years. Unfortunately due to a number of companies closing operations locally the absorption rate for 2010 still maintained its negative status, however it could have been much worse if those companies did not expand. The end of year 2010 showed a slight decrease in Suburban Class “A” building Vacancies starting at 12.5% in late 2009 and closing at 12.4%, mostly due to a new build to suit for the Reading Hospital and Medical Group, along with companies increasing their footprints at 1 Meridian Blvd in Spring Ridge and The Wyomissing Corporate Campus in Wyomissing. Class “A” buildings have typically been a safe sector in the marketplace because of low inventory; however with new developments coming on line, and companies looking for lower rents the Class “A” sector may see less demand, greater competition and potentially more vacancy. Class “A” rental rates in 2010 remained stable with rates ranging from $15.50 – $16.75 (Triple Net) on the high side; however there was considerable downward pressure on pricing within this segment. The Class “B” sector experienced the same issues in 2010 as did Class “A”, starting at 13.7% and ending at 13.6%, however while vacancy rates decreased, rental rates remained steady. Base rental rates within this sector range from $8-9 per square foot and tops out at $12-13 per square foot with gross rates coming in around $15-16 per square foot! Recent absorption has come mainly from expansion of operations by companies already in the market. Downtown City of Reading, although has seen some new deals consummated, like the Greater Reading Chamber of Commerce, Greater Berks Development Fund and Berks Economic Partnership leasing space at 201 Penn Street, the market remains flat due to these companies coming from existing space within the City. Buildings that have seen vacancy for some time, including 645 Penn Street and 501 Washington Street are starting to show some signs of hope due to new management and ownership changes taking effect. Owners and tenants are continuing to struggle with high parking costs and security concerns, which are continuing to be addressed by a committed City Administration. Downtown City of Reading vacancy rates continue to increase in late 2010 with rates rising 15.6% to 20.7% in Class “B” Product with much of the vacancy continuing to surround large blocks of contiguous space. The City of Reading and economic development groups have been working hard to improve and revitalize Downtown which shows in the number of projects underway. The new IMAX Theater and the nearly completed addition to the Reading Eagle Headquarters in the CBD are welcome entrants to the market and kick off a multi-million dollar main street corridor project that includes a new $67 million Doubletree hotel and garage project across from the Sovereign Entertainment and Expo Center. This will help attract a more vibrant restaurant and entertainment segment with increased amenities and ultimately assist to bring tenants back downtown while decreasing vacancy rates and increases in the tax base. 2011 is showing some signs of hope, with new tenants entering the market place, and rental rates continuing along a steady course.